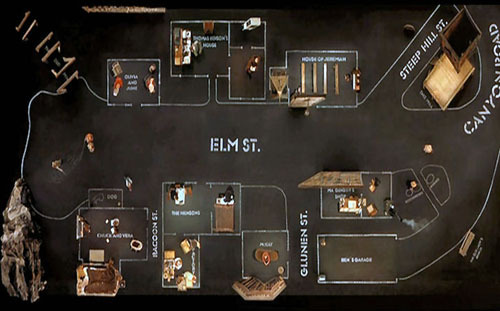 Got pointed to this Dogville reference today – stills from the movie which is also playing with notions of map and territory; where the scenes are represented only with plan drawings with only a few physical props.. This image makes me want to see these figures in your micromegas world. Until I saw these, I didn’t realise how uninhabited they are. Seems like figures could occupy the ‘territory’ at different scales. 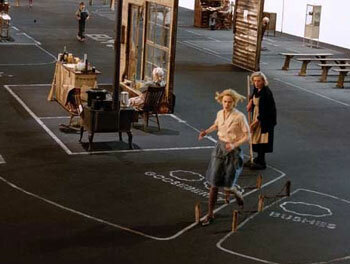 Look at the picnic scene of superstudio. Figures who are in the midst of an activity on one of your planes/surfaces/objects could be quite useful to stage the scale and attitude of this universe…….Or it might be rubbish.